Today’s parents play a critical role in college admissions. 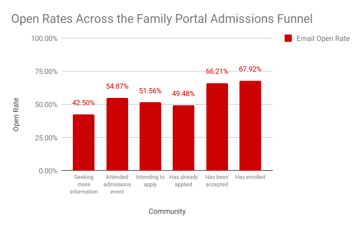 Parents are involved at all levels of the admissions process, influencing what schools their children apply to, which campuses they visit, and where they ultimately enroll. 271 prospective parents signed up for the CampusESP Family Portal in the winter of 2018. By Fall 2018, results showed that 50% of parents using the CampusESP Family Portal had a student enroll at the university. CampusESP compared the institution’s regular enrollment rate to the enrollment rate for students who had parents using the Family Portal, using Fall 2017 admissions statistics from the National Center for Education Statistics (NCES), . Results showed that the enrollment rate for students with engaged parents in the CampusESP Family Portal was more than 30% higher. The CampusESP Family Portal allows parents to indicate which stage of the admissions process best represents their student. The platform then tracks and summarizes engagement levels for each parent and each stage of the admissions funnel. Results from the case study showed that engagement levels increased more than 25% as parents became more invested in their student’s admission to the university. Email open rates jumped from 43% (for parents seeking more information) up to 66% (for parents of accepted students) as the university communicated more meaningfully with prospective parents. Read more about the impact of parent engagement on student success HERE. Older PostHow Auburn University leverages family involvement to drive student success.